Whew! 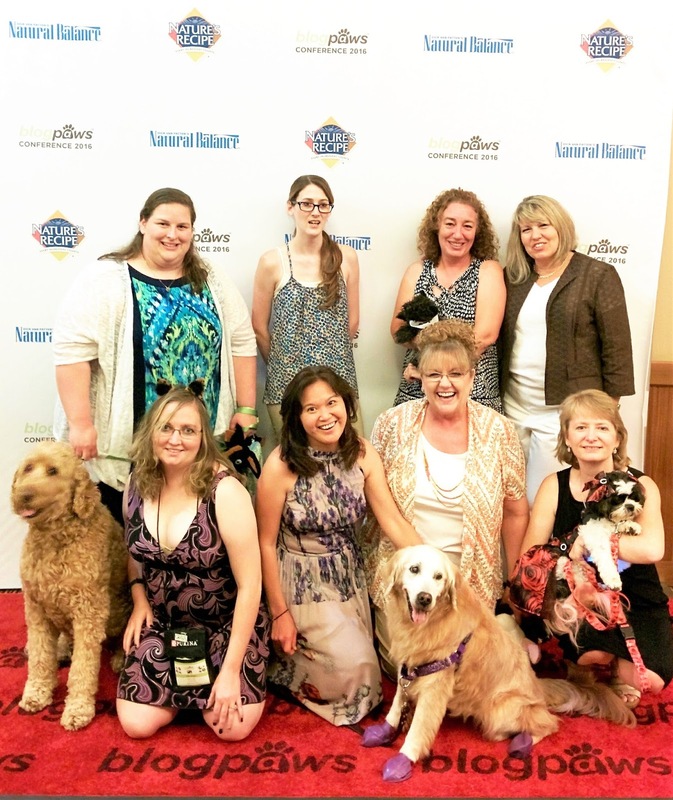 The BlogPaws blogger's conference in Phoenix was a whirlwind of activity! This was my third conference, and I was just as excited and delighted as I was the first time. 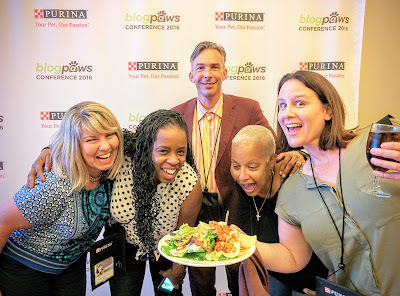 I wanted to share some of the great information I came away with for those who were unable to attend the BlogPaws conference. While I can't offer you a total brain dump, I've boiled it down to a few of the tips that resonated most with me from each of the sessions I attended. I hope you'll find these as helpful as I did! Bernard Lima-Chavez from DogandHisBoy.com, Kimberly Gauthier from KeepTheTailWagging.com, and Cathy Bennett from GroovyGoldendoodles.com during the Purina Yappy Hour! One of the first insights Carol and Maggie shared is that "It's more important that you have an engaged audience than a high number of followers". It's so easy to get caught up in the numbers and lose sight of how engaged your audience is. Good advice! When you promote a blog post, spread out your shares over 1 to 3 weeks vs. bombarding all your channels with the same message all at once. This makes total sense, I hate seeing the exact same message across one person's many channels on the same day! Don't you? They also advised to "Schedule your shares out, but respond to readers in real time". I don't know about you, but responding quickly to my readers is something I need to work on! 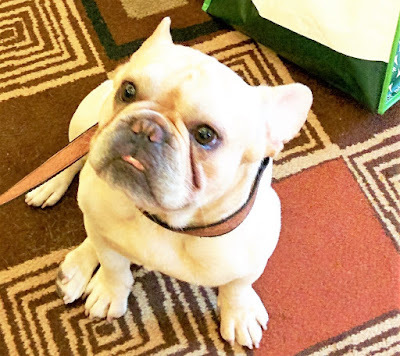 Louie, the Jones Natural Chews Frenchie says "These gals are brilliant!" They suggested that bloggers "Attach your latest blog post in your email signature". They also suggested we "Work your email list and send your key posts to subscribers (don't bombard them with all of your posts, be selective)"
I was happy to hear them say it was ok to "Update older posts and photos, but keep the URL and title the same, and promote these posts". I always felt like once my posts were out there, they were done, no take-backs! After hearing that I went into an older post added an Update and a new photo. 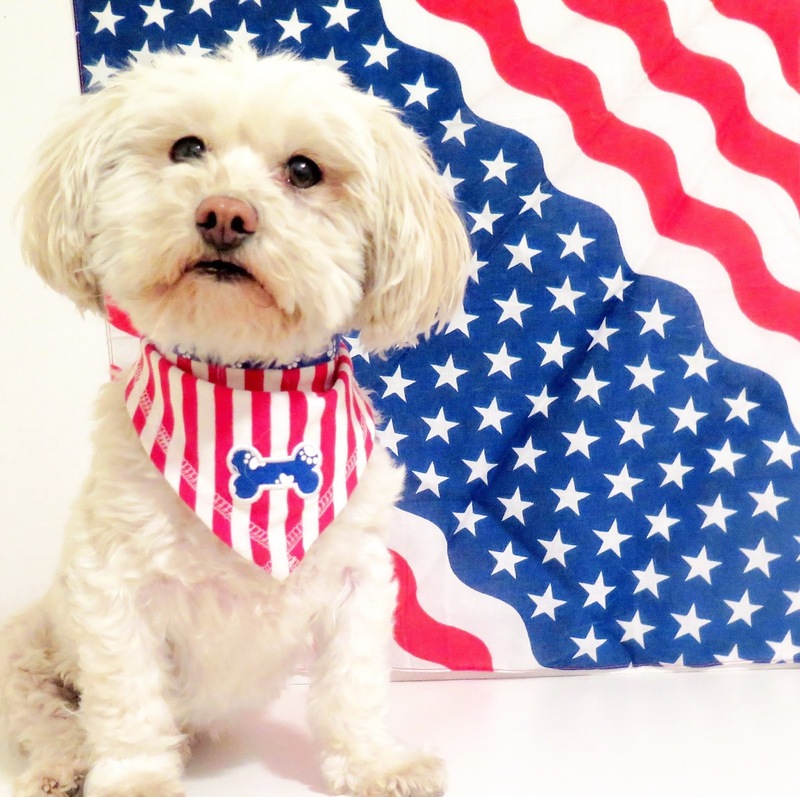 Then I tweeted it out a few times over the weekend, as it was relevant to pets getting lost over 4th of July weekend. Some great advice was to "Reference (by tagging and mentioning) people whose radar you want to be on". I love this tip, in fact I have something in mind I'll be trying out very soon. I'll blog about the result, so stay tuned! Another good tip: "Don't use the same photos on every channel, use different photos for different channels". Sometimes it's hard to get enough of a good collection of photos for a blog post and social shares, but no one wants to see the same photo all over the place. Lea Ann suggested that we "Include a video or pictures on all your pitches for blog posts, books, etc." Lea Ann talked about LinkedIn, something many bloggers don't pay a whole lot of attention to. She pointed out that "Executive decision makers use LinkedIn as their social media". She advised bloggers to use LinkedIn to search for decision makers and connect with them. I will add that bit of advice to my repertoire for sure! 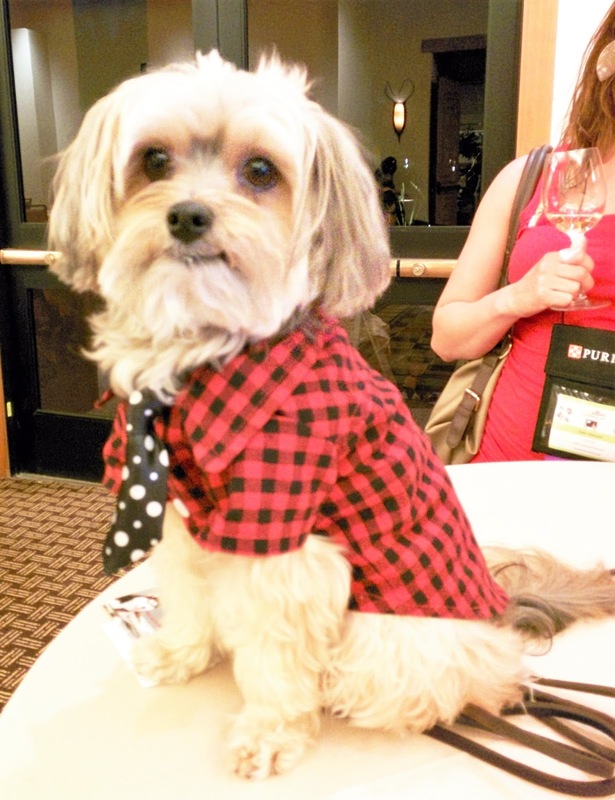 Tenacious Little Terrier's Mr. N poses for adoring fans during a conference Yappy Hour! Interestingly, she pointed out that Snapchat's demographic is 16 - 24 yr. olds and LinkedIn's demographic is 35 - 44 yr olds. If you're looking to target Millennials, you might want to add Snapchat as a social media channel, or at least put it on your radar. Lea Ann also said that "Instagram is great for the pet world", and that "Even the Westminster dog show is on Instagram!" I definitely plan to spend more time growing my Instagram account! Another important thing she stressed was the importance of mixing up pet hashtags with non-pet hashtags. That's a really good point. 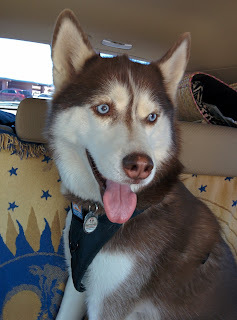 I blog a lot about pet travel, so I'll start incorporating more general travel hashtags, not just #pets or #pettravel. I'll also start looking for more parenting hashtags, as parents are the decision makers in the purchase of pet products and family vacation planning. 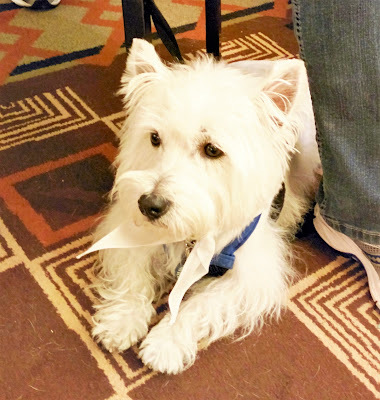 The adorable Pierre of Barking From The Bayou takes a break among all the conference excitement! Bernard Lima-Chavez of Dog and His Boy & Amanda Yantos of Dog Mom Days talked about blogging From Starting Out to Cashing Out! I knew I'd pick up a lot of great information from Bernard and Amanda. These are two bloggers who have come very far in a relatively short period of time in the blogging world. A great tip from Bernard and Amanda was to "Identify blog posts that bring a lot of traffic to your site and write more posts that are similar"
This is a great strategy. Link these posts together for an even greater impact. Bernard advised us to "Watermark all your photos and never use stock photos in a sponsored post!" Fortunately, I don't use stock photos, at least I haven't had to yet! I'll keep this advice in mind though. Brands are looking not only for your audience, but for your authentic voice and your pets in their sponsored posts. One of my favorite happy, smiling photos of my Husky, Icy. Another tip was to "Show happy pets in sponsored posts, don't use dark or dreary photos, unattractive staging or scared pets. Be sure to show the product and product packaging in your post." It's not always easy to get my dogs to "smile", especially Phoebe, she's kind of a serious girl where treats are involved! I once read an article that suggested a short play session or walk with your dog just before a photo session. They'll usually pant afterwards, which makes them look like a "smiling, happy dog". Always on the Best Dressed list, Coco of Coco, the Couture Cat gives us all a lesson on how to Rock the red carpet! Amanda shared that "For an easy, inexpensive photo background, she uses colorful or holiday fabrics from the craft store". In this photo I used a large patriotic bandana as a backdrop for a photo with Phoebe and it worked well. I am so running to the craft store for fabric remnants to use as backdrops for my photos! OK, this next one really hit home for me. If you haven't experienced it yet, you will as your blog grows. Many of us are often asked to write for a brand's publication, such as a newsletter or magazine without any compensation. There may be times when doing so is worth writing a free post. To help you decide, they suggested we "Ask the brand how they will share what you've written and ask them for the stats on How they will share, How many times will they share it and on What channels? Find out more about their audience as well; the number of followers and their demographics." I've come up against this dilemma several times with the promise of "exposure" vs. compensation it I write for a publication or brand. I've chosen not to write for free because I feel like I'd be sharing the content I write for them more than they will, and they'll end up benefitting from traffic I bring to them. There are some publications that request frequent original content from bloggers for no compensation at all. I normally decline such invitations, however this is a great way of looking at it! I'll ask these suggested questions next time the situation presents itself. If they can't provide me with solid numbers, in writing, I will pass, but who knows? I just might find a viable opportunity! I have more tips and hacks to share with you from the conference, but I'm going to stop at this point. It's a lot of great advice to digest! Visit us again next week when I'll be back with Part 2 of the BlogPaws conference blogging tips and hacks that resonated most with me. I hope you've enjoyed reading this and found some helpful tips to grown your own blog! 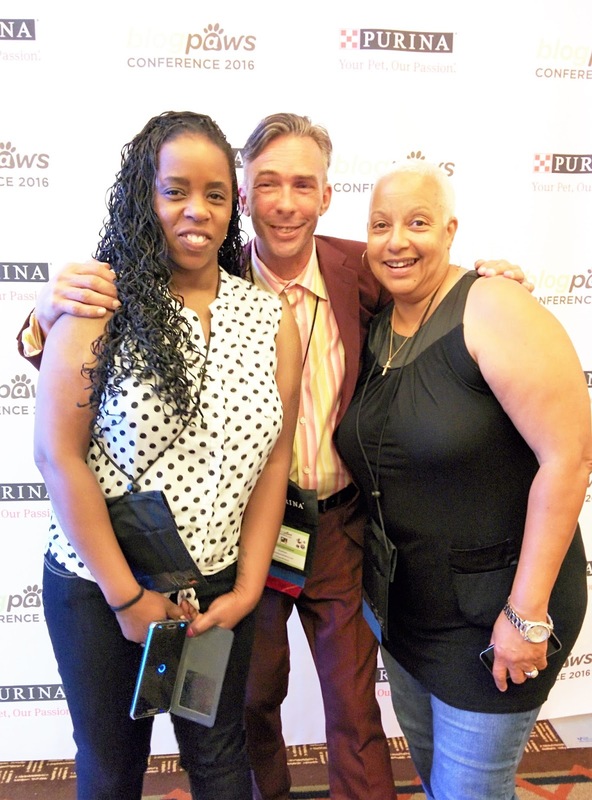 Thank you to all the great BlogPaws Conference speakers - you all ROCKED the conference!! BlogPaws conferences serve up a smorgasbord of Networking and Learning! 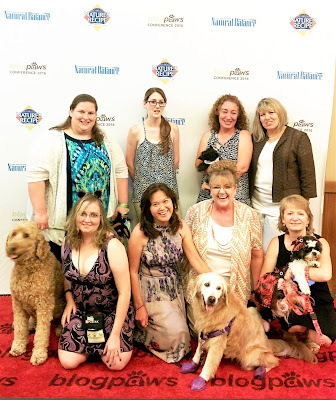 I've already purchased my BlogPaws conference ticket for next year, have you? I hope to see all of you next May in Myrtle Beach, South Carolina for BlogPaws2017! Visit my Pinterest board FOR BLOGGERS for lots more helpful tips and advice for bloggers. I've compiled some great information from social media and blogging experts! Let's follow each other on Pinterest. 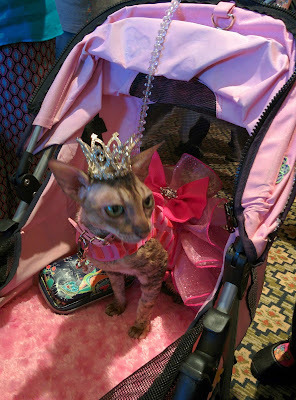 JOIN US ON THE PET PARADE BLOG HOP!! Thanks for sharing all these tips! Great information! Glad you liked them, Nichole! What a great post with so much useful information. These were all sessions I didn't attend and I think I got more from this post than I would have had I been in the sessions! LOL, you are too sweet, thanks for saying that! I'm really glad this information is helpful for you. Wow, this is a wonderful recap! I also attended the Social Media session - wish we would've met. Perhaps next year! I'm sorry we didn't get a chance to meet too! I wanted to congratulate you on being named a finalist in the Nose to Nose awards. Whether you win or not it's a huge honor to be a finalist! I'm so glad you enjoyed my recap, thanks. We'll make it a point to meet next year in Myrtle Beach! Thanks for sharing! I didn't make it to some of these sessions. I'm still processing all the info. I'm very happy to share, you're so welcome! There are so many awesome sessions and only so much time. I missed Aimee Beltran's session on branding, which I know must have been fantastic. It is so much to process, but such a growth opportunity, right? So much great information & so many great sessions! I'm glad you enjoyed my post. It really was such a great conference and fun to see you in person. Thanks for the great summary as I missed those sessions. I'll be back next week too. I'm so glad it was helpful! Great seeing you too Susan! Thank you so much for these tips. This is perfect because I didn't attend all of the same sessions. Duh...thank you so much for the shout outs. ♥ You're the best. I love when people share about tios learned in sessions I didn't attend. It's really helpful to me. I'm glad you enjoyed these tips! And you're very welcome for the shoutout! WOW! I wasn't able to attend this year, so I really loved being able to "pick your brain" and share in the wonderful things that resonated with you. Great tips and hacks! I could read this post every week and get something new out of it all over again! Oh thanks so much, that's so sweet of you go say! I'm really glad you found it helpful! I hope to see you at next year's conference. Thanks so much for sharing all these great tips, Cathy! I loved the tip "Don't use the same photos on every channel, use different photos for different channels". I never thought about doing that. I'm glad you enjoyed the post! I loved that tip too, now I'm being careful to change up my photos on social, it's not that easy! I really learned a lot from Maggie and Carol's presentation and am now trying to do a better job at sharing my posts over a few weeks - so this does take a bit of organizing and I am not the most organized person. I also am trying to incorporate LinkedIn. I absolutely don't know anything about Snapchat, but supposed I should look into it. I loved this session so much! I am also trying to spread my social shares out more, it does take more effort. Great summary! I didn't attend a couple of the sessions you referenced, glad to get that info since I wasn't there. I'm glad I could help by sharing! Wow so much more to learn, slowly will get there, I use LinkedIn a lot and feel its very important for my blog today. thanks so much for sharing your information. Yes there's so much to learn! I don't use LinkedIn much, I need to beef up on that. Great summary. I haven't had the chance to summarize my notes yet, but I learned so much. Happy to hear you're coming to my state of SC next year. What an excellent review, thank you, Cathy! Also pinned on my "Bark About" board! So glad you enjoyed my post & thanks SO much for sharing it! I'm always happy to share! Yes learning + fun is a winning combination! I'm so glad you're going to next year's conference, I love your blog & I really look forward to meeting you! Yes, I'm so happy we met too! Photos & hashtags are super important! Thanks Spence! So much amazing information, my brain hurts but I love it! Thanks for sharing these tips from the Conference! For those of us, like me, who couldn't attend it's great to still get valuable information. Cathy you are so sweet! I really appreciate ALL of your support. It means a lot that you attended our session. I can't wait to see the great things you have in store for your blog! You're so welcome Amanda! Thanks for sharing all your tips with us! This is such a great roundup! Such good advice, and I need to start using most of this. I have my ticket for next year, and I hope we can say hi to each other next time! The Secret Life of Pets Mania!